​​​​ ​HOUSTON – As the growth of e-commerce (a transaction of buying or selling online) continues, its impacts on logistics and operations within the industrial real estate sector become more significant. Industrial operators are increasingly looking to air and rail transit as distribution channels. 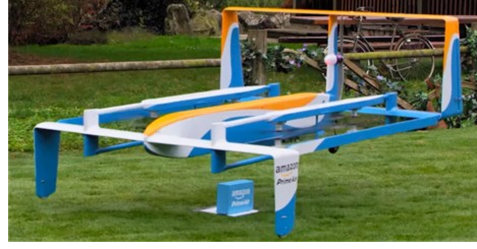 Amazon is experimenting with drones as part of its Prime Air delivery system. Prime Air is a delivery system from Amazon designed to safely get packages to customers in 30 minutes or less using unmanned aerial vehicles, also called drones. ​The impacts of e-commerce—estimated to reach $486 billion by 2020 according to supply chain consulting firm Tompkins—within the industrial real estate sector will become more significant. To meet the e-commerce demand, industrial developers will have to supply about 160 new logistics facilities spanning 800,000 sf in top urban markets. Another 100 or so facilities in the 75,000- to 100,000-sf range will need to be repurposed to support delivery to secondary and tertiary markets. Rail served properties are also in high demand as nearly 147 million sf of new industrial product has been constructed within five miles of a rail terminal since 2000. Check out more Houston Industrial Market Research.